Tragically, Geeta’s story is echoed across the country. Her three, dead-before-birth, babies are part of the 592,000 stillborns in India each year, earning the country the dubious distinction of the highest number of stillbirths globally. Experts caution that while maternal and child deaths have halved, stillbirth remains a neglected global epidemic. An appalling 50% of the 2.6 million stillbirths that occur globally every year are actually preventable. Research highlights that most of these deaths could be prevented with timely and quality antenatal monitoring and care (Lancet Stillbirth Series, 2016). Geeta’s doctors had recommended that she undergo protein treatment at Lilavati hospital in Mumbai, and so she moved to the city with her husband two years ago. Early this year, Geeta was both ecstatic and terrified to find out that she was three months pregnant with twins. Because of her history of stillbirths, she was very worried about losing these babies as well. Fortunately, Geeta’s locality comes under the coverage of CCDT’s mMitra program: a m-health program (Mobile Health Messaging through Automated Voice Calls) to advance reduction in mortality & morbidity of mothers, neonates, infants and children living in urban slums. Through this program, pregnant women like Geeta or lactating mothers receive regular, timed and targeted information through automated voice calls — on preventive care and simple interventions in the event of emergencies. The voice calls are sent directly to registered women in their local language and contain information specific to a women’s gestational period or the age of the newborn. Soniya, CCDT’s community outreach worker (mMitra Program), explains to Geeta how the voice calls work and what information she can expect to receive through this platform. CCDT strives to not only connect pregnant women to public health services, but also, to encourage public health service providers to fulfill their duties and reach out to community members. On account of these advocacy efforts, Kajupada’s Health Post Medical Officer Sonal Dendulkar visited Geeta during her pregnancy to explain the importance of ANC care, nutrition, adequate rest, and regular ANC checkups for a safe institutional delivery. Like her previous two pregnancies, Geeta began to experience intense contractions during her eight-month. However, this time around there was someone to call. She immediately contacted Soniya who referred her to a medical practitioner and she was treated accordingly. 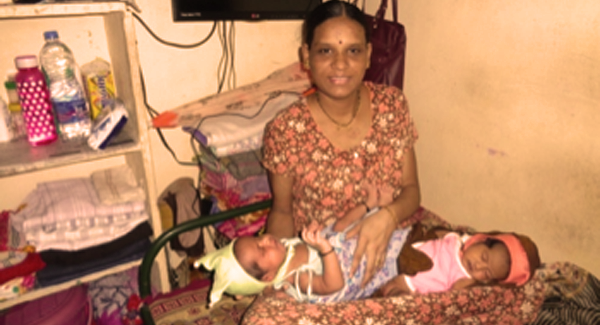 Geeta delivered two healthy, full-term twins at the hospital where she was registered. “The first time I heard my babies cry…I cannot explain to you the feeling”, said Geeta. “After so many disappointments, pregnancy after pregnancy, I couldn’t believe that I actually delivered two healthy babies. I never imagined that this would be possible after the last three stillbirths.” Geeta delivered a healthy boy and girl who weighed in at a remarkable 3.6 kgs and 2.78 kgs, respectively. Her husband called Soniya to inform her about the delivery and express his gratitude. Geeta and her husband fondly refer to their babies as “mMitra twins”. They will continue to receive information and support via the program until their twins reach two years of age. Like Geeta, CCDT’s team has reached out to almost 60,000 pregnant women and lactating mothers across of Mumbai city, since 2014. We continue to empower and encourage mothers to safeguard those critical early moments from pregnancy until their babies are two years of age…. giving as many children as possible a healthy start to life. Note: The memory of Geeta with her twins will remain etched in our minds forever and will keep inspiring us at CCDT. Soniya (26 years old) is our youngest team member who joined CCDT’s mMitra project just seven months prior and had undergone rigorous capacity building training. She took on this case as a challenge under the guidance and monitoring of her team leader Neelam Jambhale.